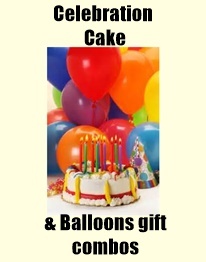 15% off your Cake order when you print this page. offer ends 23rd FEB 2019!! 2. this offer will not be accepted at a later date example: on collection of cake. 3. this offer cannot be used with online/telephone orders. Changes to designs,flavours or sizes are not included. addtional colours added to design may alter cost. 7. only printed versions of this offer will be accepted. Screenshots on phones, tablets etc will not be accepted. 8. Offer will run until The Cake Box's discretion. Offer start date 1.09.18.
offer ends 23rd Feb. 2019.
keep an eye out for more offers in the year. 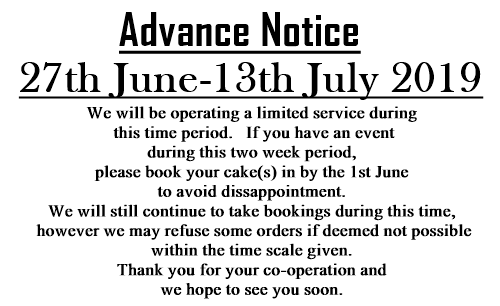 please see advance notice above. Flavours and some designs require longer notice. please call us for more information or view our ordering page. sometimes we can squeeze in late orders...but there are limited spaces for this. of course you can always give us your order earlier than these times too! Just a few comments we have received recently. We had a cake from you on Saturday to celebrate our father’s 90th birthday. light and soft synthetic cream which is my favourite and complimented the sponge perfectly. was empty and extra slices were requested to take home for some. Thank you so much we were very very pleased with it. Thank you so much for the "Dexter "Cake I collected on Saturday 16th August. For many years I have used other companies and then someone recommended you to me. Wow! not only does it look amazing , it tastes amazing. My husband David loved it! Definitely will be returning to you guys again and again. Your cakes are fantastic ! Such attention to detail. You have an amazing skill. I just wanted to email you to say thanks for the bouquet you made for my nan's 70th birthday. It was fantastic and tasting amazing, everyone loved it!! My nan actually thought we had bought her some flowers so we had to tell her straight away it was a cake otherwise she might have started watering it!! Tracy Kennedy You did my wedding cake, our bottom layer was Chocolate Fudge it was gorgeous and melted in the mouth, loved the Madeira sponge and the Lemon tier too. And not forgetting the Wombles you made for our toppers. HIGHLY recommended with a amazing selection to suit everyones taste buds!